Please welcome Trina of A Country Farmhouse!!! I am so happy to be a guest blogger for Lauren at Pure Style Home. From the first day I discovered her blog, I've been a devoted follower as she continually inspires me with her fresh, beautiful designs. In keeping with the before and after theme of her guest bloggers, I thought I'd share with you a few snippets from our farmhouse renovation. Just to give a little background, my husband and I purchased a 1923 farmhouse about four years ago. We hadn't anticipated buying a place that would become a whole house remodel, but it was in our price range and the property had everything we were looking for in a country home...land, privacy, peace and quiet, and scenic views of the surrounding farmland. The farmhouse was built back in the early 1920's, but over time had gone through 1950's, 1960's and 1970's era remodels which stripped the home of much of its original charm. 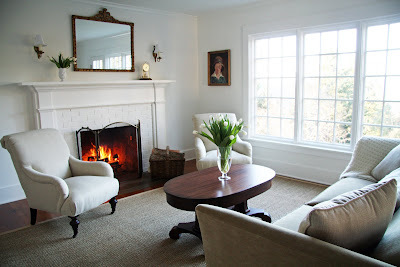 Our goals were to restore the charm and to create a home reflective of its surroundings...calm, quiet and relaxing. 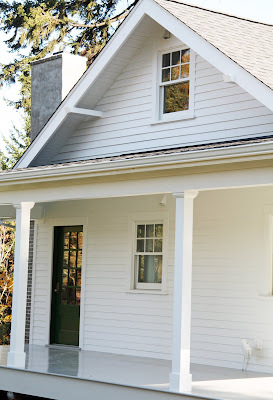 Working from the original structure you see in the before photo, we added a wraparound porch, a shed dormer to the half story, and a dining room, replaced the roof, siding, windows and doors, and gave the house a fresh coat of paint. We used an array of inspiration photos of historic homes in our area and from magazines to guide our design decisions. We wanted all of our renovations to look appropriate to the era of the house. This goal inspired us to do a simple farmhouse-style kitchen with painted custom wood cabinets, a farmhouse sink, restored wood fir floors, and open shelving. 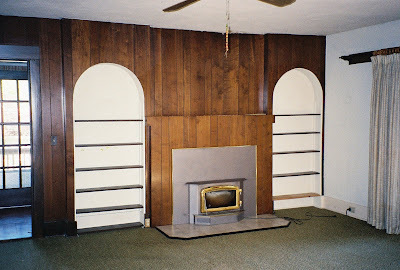 We stripped the paneling off the walls and mantle, removed the stove insert and the pea green carpeting, covered both bookcases, and restored the fireplace with a new custom mantle. We also replaced the single-paned picture window with three large casement windows, replaced the door with a french door, and added new crown moulding throughout. 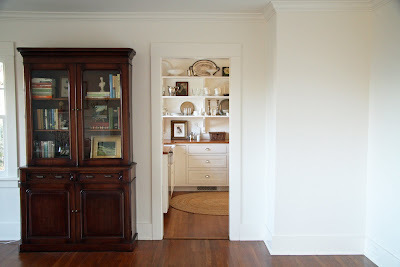 The entry was lined with plastic shelving and parquet flooring when we bought the place. We decided to create a more inviting entry by restoring the original wood flooring, and adding a new casement window, a replacement french door, new crown and base mouldings, and an antique hall tree. 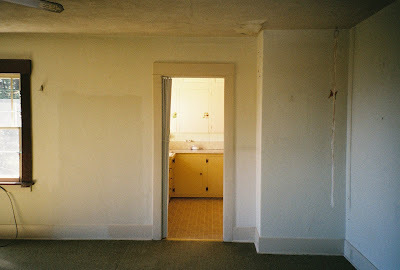 This room has one of my favorite before photos as it pretty much sums up the tone of the house when we bought it. 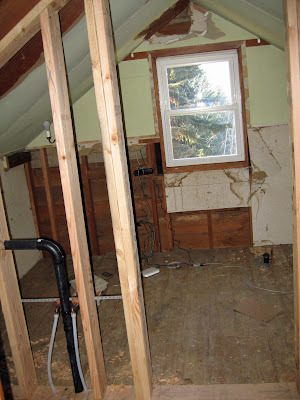 We ended up completely gutting this room in order to update plumbing and electrical. We also used this time to plumb in lines for a new upstairs bathroom. 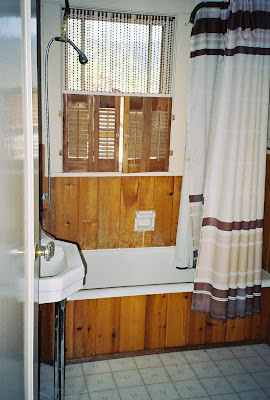 We put down historic tile floors, replaced the double hung window, installed new drywall, crown and base mouldings, and added a new claw foot bathtub, sink and toilet. 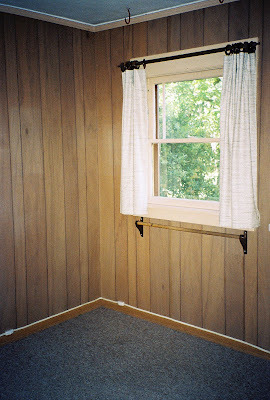 This room was covered in paneling as well. 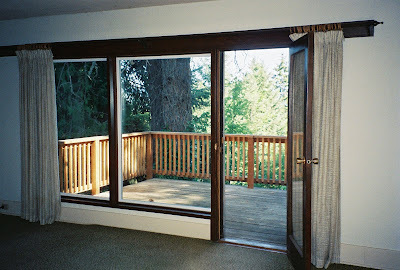 We removed it, removed the gray carpeting, installed base moulding, and added new double hung windows. It's a small room and serves us well as a den. All furnishings, besides the jute rug and the armchair, were things we had on hand thus helping with our budget. 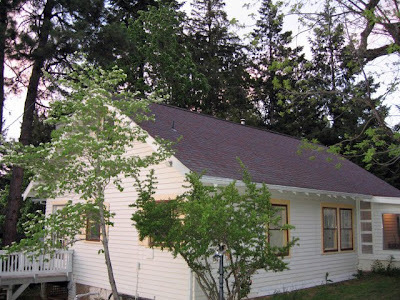 The addition of a shed dormer on the existing half story offered us the ability to expand our living space upwards. 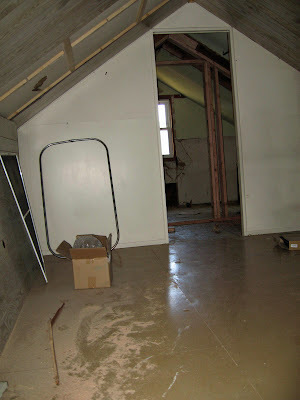 Before the dormer, the space was used seasonally and was very dark and cramped. With the dormer, we turned the seasonal half-story space into an entire master suite, including master bedroom and bath, walk-in closet and home office. 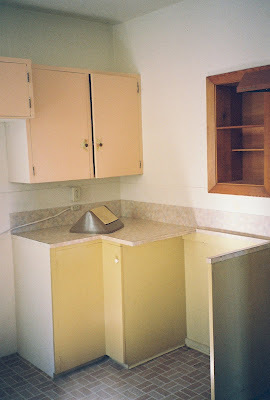 I hope you've enjoyed our renovation story! The blogging community has been such an inspiration and provided us with that extra motivation to keep plugging away at our projects! Trina- thank you so much for sharing your perfect home with us!!! I love how light & airy you've made it and you've got such a restrained touch. Everything isjust beautiful and your photos belong in a magazine. Thanks for the tour!!! What an incredible and gorgeous transformation. i absolutely love the kitchen. it's all fabulous!!!! this was one of the best before and afters i have ever seen, i did not want it to end! trina you are very talented, every aspect of your "new" home is exquisite. 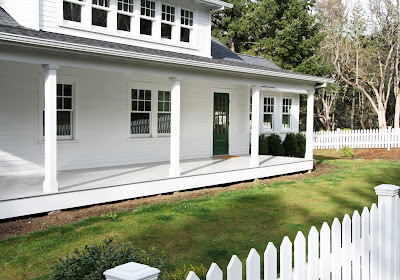 noticed one bit that had me wondering....the exterior porch floor is so seamless and polished. how did you achieve that? love her and her farmhouse! 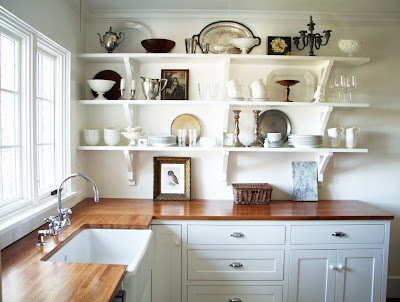 Love it....i used to have BUTCHER BLOCK counters in my first home, they were so pretty! SO Jealous- love fixer ups-and love the old homes-farm houses of any sort- im sure frustrating-and long-but what an outcome- I love it.. So Pretty..
great Job-so glad you took before-afters. 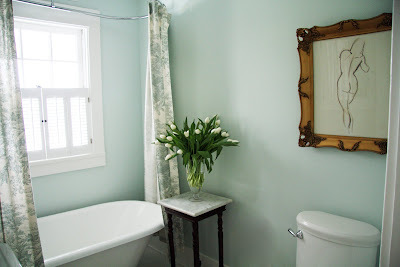 You know I have been in love with your home since my very first visit via Lauren's blog. It was such a pleasure to revisit some of these beautiful and thoughtfully renovated spaces again!!! Love, love, love this! Perfect!! 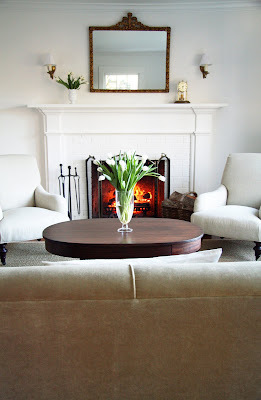 Trina's guest post truly lives up to your moniker: Pure Style Home! Her decorating definitely has a point of view. It is country without being cliche. It is also very classic AMERICAN country, which I happen to LOVE! I am so glad that she left a little note at her blog directing us to PSH. I'm going to enjoy getting to know YOUR style, Lauren. Time to take a peek....! Happy Monday. An amazing transformation. I love it all! Oh wow~ I just love a good before and after! I especially love a well appointed farmhouse! Just perfect. Yay for Trina. What huge talent, style and a beautiful person too!! I always love to read your blogs and alway love when you have a guest blogger. You have such great blogger friends. 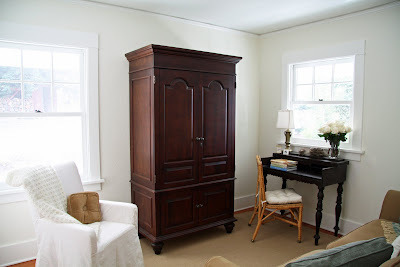 I just posted a before and after on our country home. Please stop by to take a look. What a difference! That kitchen is stunning and simple. 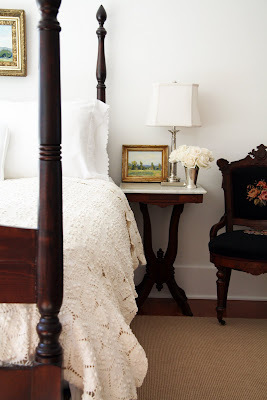 Love her blog...but haven't seen ALL of these amazing befores and afters...just stunning! They really saved that house ! It is beautiful now. Trina, your lovely home provides so much inspiration and I love everything about it! 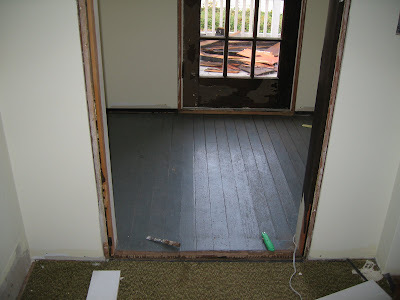 Thanks for sharing your wonderful remodeling journey with us, both here and on your blog! Loved this post! Trina is amazing, and this post shows how talented she and her very-handy husband are as a team! It's hard to believe that this was their very first renovation, as it is masterful! Wow this post is beautiful! What a gorgeous house and so nice to see the before's and after's!! It is beautiful in every way. I too love the restraint and simplicity. And the light...heavenly. Stunning, thank you so much for including the before & after transformation!! Great post and tour Trina! You know I adore your home and your fabulous photography. So great. I just love the clawfoot in front of the window. Such a peaceful bathroom!! Great work. Wonderful guest post Trina! If there was a prize for transforming, remodeling, loving and caring for a house/property...you, hubby and Lucy deserve the first place "front door green" ribbon(no blues here) and the most amazing, "lushest" flower wreath ever known to mankind! Wow, I love it!! The transformation is amazing!!! Trina's house is amazing. Together with yours Lauren, and Janet at Gardener's Cottage, you three have my top favorite blogs!!! Just love your homes, but most especially your philosophies on life and decorating and what you find meaningful!! Beautiful job! Like going from a dark paneled cave into the light :-) Especially loved the kitchen and bath re-dos. What an amazing transformation! my jaw drops everytime I see this house, I'm so in love with it. They have done an amazing job! *** Stunning!... So young n' fresh, clean n' "frisky"! Simply "DELISH!"... Thanks for sharing! OK this is like a super before and after on steroids!! Holy amazingness!!!! This before and after is so amazing- I can not believe that is the same home- it is just beautiful! Oh my! It is wonderful....so many decisions....all of them done well....thank you for sharing....smiles. Fabulous doesnt even begin to describe this sensational house. I just love it, everything. I was trying to explain to my friend how to use a wood kitchen countertop with painted cabinets in her new house she is building. These kitchen pictures are exactly what she needs to see. Outstanding! Just realized I didn't leave a comment here, only one on your blog. What I love most about your beautiful home is how it so reflects you inside and out. It's not loaded down with a lot of fancy bells and whistles. Its design speaks for itself. Pure and simple. spectacular and inspiring. i love the white on white outside. happiness. Trina - your house transformation is amazing! It is so beautiful and light and airy. I love it! Great job! Lauren put me in line to be one of your trasformations. I am needing the final designers touch. Can send you pictures. Wow...what an absolutely GORGEOUS home! 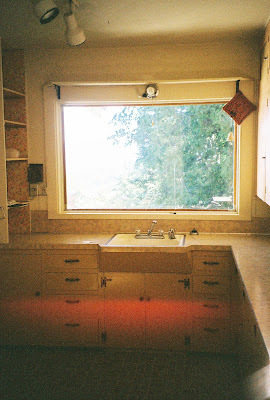 I loved everything, especially the kitchen. How wonderful to see you here. You continue to inspire so many with your classic & clean, warm & welcoming style. Pet the dog for me! Wow those are the best before and afters ever! Did you photograph the afters. if so I would love a post on some tips. is there any way we could get her lovely white paint color choices from her??? Wow- great job! What is your secret to the cutting board countertop shine? I used mineral oil but they never look that good. Gorgeous renos!! Now I'm off to find her blog. Don't see the link?? I am picking myself up off the floor now.... this is amazing!!! You are so right - it is perfect and looks like it is from a magazine! Thank you for sharing this with us! I am now headed over to her blog to see more. This is just fabulous. Off to visit Trina now, thank you so much for featuring this wonderful blogger! Gorgeous. I love it all! The kitchen and the living room...aaahhh! 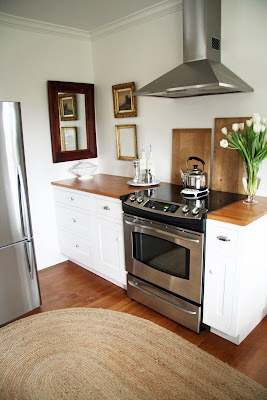 The butcher block counter top is perfect! This is a total home transformation. How wonderful to take an old sad home that has some faded beauty, and with love and hard work make it more beautiful than before. I love the deliberate care and planning that obviously went into loving this home back to life. Thank you Lauren for having Trina be your guest today. And Trina, your home and it's story is a fairy tale! This is simply stunning. I am looking at buying a house in Napa as a weekend getaway and looking for a fixer upper. This serves as amazing inspiration. I love the bathroom tiles. Were those original or did you buy them to go with the style of the house. I call them chicklet (don't know how to spell) tiles. Love them. What part of the country is this home - do you mind me asking? This is an incredible transformation, just like the sweet couple in Young House Love! I cannot see it's the same house, unbelievable and so so beautiful finish! What a fantastic story, thank goodness they thought to take all the before photos, otherwise we'd never have believed it! It all looks too good to be true! 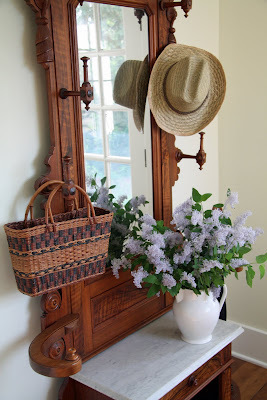 Trina's home is one of my very favorite in blogland. Love, love LOVE the incredible transformation, and her beautiful, simple style!!! Wow what an amazing before and after! 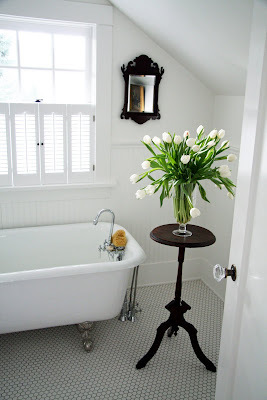 Such a beautiful renovation - simple, elegant with beautiful touches - what a labour of love. Very inspirational.